This Est-Eem Sanitiser from the Evans brand is a concentrated multi-purpose sanitiser. 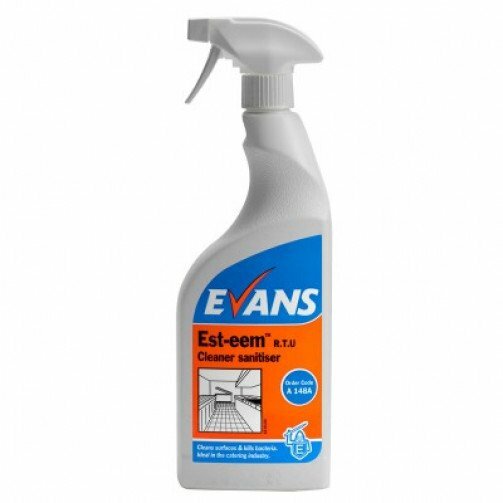 This product is an unperfumed sanitiser that can be used on a range of surfaces including worktops, cutting boards, tables, vending machines, refrigerators, kitchen equipment, floors and walls. It comes in a 5 litre container making it ideal for commercial use. It is available to buy as a single product or as a bulk buy option. Est-Eem Sanitiser Trigger Bottle, ready to use 750ml. Unperfumed, multi purpose cleaner & terminal disinfectant. Recommended for use on a variety of surfaces including worktops, cutting boards, tables, vending machines, refrigerators, kitchen equipment, shelves, floors & walls. Laboratory tests have proved it will kill gram positive & gram negative bacteria including MRSA (Methicillin Resistant Staphylococcus aureus) in 30 seconds & also the virus that causes Hepatitis B & HIV. It has also been proven to kill the growing organism (vegetative cells) of Clostridium difficile under dirty conditions. HOW DOES INDUSTRY JUDGE WHETHER A CHEMICAL HAS A HIGH OR LOW IMPACT ON THE ENVIRONMENT? Every chemical has some impact on the environment. There are many ‘green’ schemes used in the cleaning industry but none take into account all of the relevant factors. At Evans Vanodine, they have an innovative system for classifying products according to their overall environmental impact. 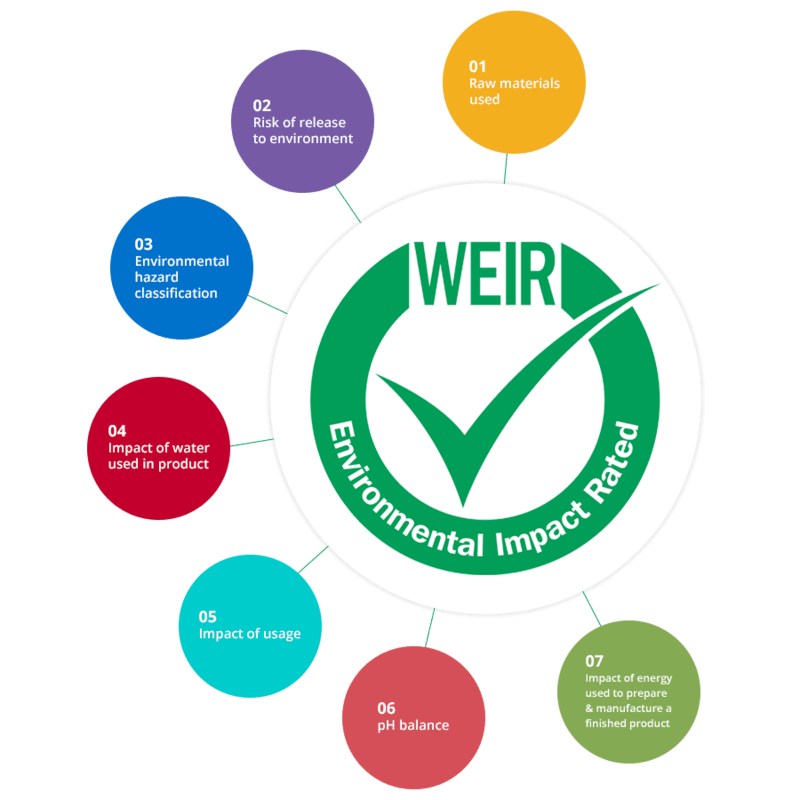 Devised by one of their experienced research chemists, the WEIR system uses a set of seven criteria to analyse its products.